We thought it would be nice to have spotlight posts throughout the month dedicated to our top 5 from the last challenge "WINTER" We hope you enjoy reading about their crafting journey and you never know it could be you in the spotlight next month. Although I have always been interested in art and craft (my gran taught me to knit when I was three and I studied child-centred Art at teacher-training college) my real crafting journey began in The Hague, Holland. I had broken my arm and couldn't teach but needed something to occupy myself as well as therapy for my fingers – the only part of my left arm I could move! 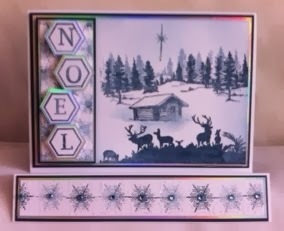 I found a decoupage kit, complete with light box and scissors which I had purchased earlier for my school Christmas craft lessons and card making followed. Fast forward three months and we were then living in Houston, Texas. Two months after joining an international group and four months since arriving in Houston, I was appointed Membership VP and kept over two hundred ladies up-to-date with information and events. A ‘sunshine’ policy was instigated whereby I was asked to send cards to members for a special birthday/anniversary, bereavement, illness, welcome or farewell. As we were a non-profit making group who sponsored overseas students at one of the universities, I volunteered to make the cards as my donation. Many of the ladies wished to learn how to create their own cards and thus I brought my teaching and card-making skills together by holding weekly classes in my home until I left to return to UK. I regularly make cards for family and friends. My latest projects are to design and make thank-you gifts for my mum’s team of carers, as well as creating Christmas cards for various family members - a number possibly in excess of three hundred and they are well under way. Another ‘must do soon’ are the advent boxes for my mother and mother-in-law. For a decade or so, both have received a box of goodies to open daily on the run up to Christmas; it used to be small gifts but now, with their advancing years, it is a chocolate or similar in a handmade, decorated container. Then of course, is the Clarity ‘Christmas’ challenge. 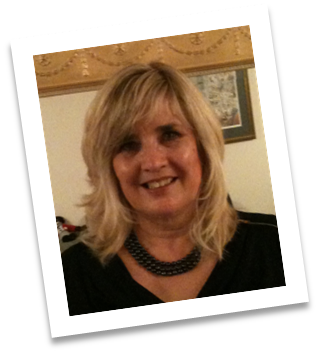 As a primary teacher with over thirty five years of teaching experience both national and international, I have always linked creativity with education and various art and craft activities were always to be found in my classroom. I no longer teach but I feel creativity lives on in my cards. I am absolutely thrilled to have been chosen as one of your top five, particularly as it was my first entry. Thank you! Here's Shelagh's Winter themed card using different shades of blue to create her scene. a blog so you could do the same too! You don't have to miss out because you don't have a blog! Thank you for sharing your crafting journey with us Shelagh and we look forward to seeing more of your artwork in our challenges. Wonderful card Shelagh, hope you have enjoyed being part of the Challenge and will show us some of your lovely creations again.